Former president Jacob Zuma and Dudu Myeni. Inside a private lounge at the Sheraton Hotel in Pretoria, Angelo Agrizzi watched as Bosasa CEO Gavin Watson handed R300 000 in cash to the head of the Jacob Zuma Foundation, Dudu Myeni. On another occasion, a luxury Louis Vuitton handbag was stuffed with another R300 000 and allegedly given to Myeni. 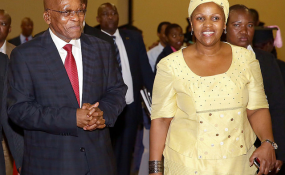 As close confidante to former president Jacob Zuma and head of the Jacob Zuma Foundation, Myeni played an integral role in the relationship between Bosasa and Zuma since 2015. Following three days of explosive testimony before the Zondo Commission of inquiry into state capture, former Bosasa boss Angelo Agrizzi will deliver more hair-raising bombshells in the week to come. News24 understands that Agrizzi is set to reveal how Myeni allegedly took delivery of R300 000 in cash every month, destined for the foundation's coffers. He is also set to reveal how Watson wanted Zuma to interfere in the investigation, and later even planned to lobby him to appoint a National Director of Public Prosecutions that would be sympathetic to Bosasa. On one such occasion, Myeni produced confidential NPA documents and discussed an ongoing investigation by the Hawks and the NPA with Watson and Agrizzi. Agrizzi will claim that Myeni told him and Watson that she was trying to get the case "shut down". Agrizzi photographed the pages. These photographs have been handed to the Zondo Commission. On Wednesday, evidence leader Adv Paul Pretorius revealed that the commission investigators had been able to confirm that the pictures were taken at the Sheraton Hotel through matching the carpet pattern in the photos, and had also confirmed that Myeni had indeed stayed at the hotel on the same evening. In 2009, the SIU finalised a report detailing how Bosasa had bribed former prisons boss Linda Mti and correctional services department chief financial officer Patrick Gillingham with cash, cars and gifts in exchange for multi-million rand catering and fencing tenders at prisons around the country. The report was referred to the NPA in February 2010 by then correctional services minister Nosiviwe Mapisa-Ngqakula, where it has since gathered dust. Amid allegations of 'political interference' and incompetence, little to no progress has been made to date. On Saturday, News24 reported that this investigation was now finalised. News24 also previously revealed that Bosasa had installed security systems including high-end CCTV cameras at Myeni's Richards Bay home free of charge. Myeni would not comment when contacted at the time. On Wednesday, before Agrizzi's testimony started, Pretorius informed deputy chief justice Raymond Zondo, who is chairing the commission, that much of Agrizzi's evidence was yet to be corroborated by investigators.